It’s a great big world of science out there. And picking your own path is just part of the fun, a group of middle school girls learned recently at Arizona State University. “Make sure that you’re always open to all kinds of things,” Arizona State University biogeochemist and oceanographer Hilairy Hartnett told the eighth-graders from the Peoria Unified School District. “You never know what might be more exciting than you think. The dozens of students — with their school district’s Medical, Engineering and Technology (MET) Professional Academy — were visiting ASU’s School of Earth and Space Exploration as part of an effort to get more girls interested in STEM fields, just in time for Women’s History Month. “We are sponsoring this trip ... to create a pipeline for eighth-grade students who have expressed an interest in science, engineering, technology or math, to give them exposure and get them excited and empowered,” said Adriana Parsons, MET Professional Academy director. The goal of that program is to prepare students for careers in high-demand industries. Hartnett, who runs the CaNDy (Carbon and Nitrogen Dynamics) Lab at ASU, talked to the girls about her experience in the science field, the type of research done at the lab and encouraged the students to seize opportunities when they present themselves. The students then toured her lab. Later in a classroom, seven ASU undergraduate and graduate students — all women — shared with the girls what they study at SESE, from astrobiology and stars, to life on Mars. Each table of students was given a task: Out of eight areas of research, pick one and discuss how many scientists it would take to study this field. It was then that a room full of girls who didn't know each other, from different schools within the Peoria Unified School District, began to brainstorm. A quiet room with hushed voices turned loud, with engaging conversations, head nodding, agreement and laughter. Each table had one of the seven ASU students asking thought-provoking questions of the girls. “One of the main goals of the MET Professional Academy is to increase female participation,” Parsons said. Nya Udengwu, an eighth-grader from Kachina Elementary School, became interested in technology, engineering and math from a prior visit to ASU. She envisions the world much different than past generations, when few women were employed in these fields. During this visit, Udengwu wanted to see what ASU had to offer, and Hartnett summed it up perfectly: Because ASU is such a big university, it is a great place to not know what you want to do. It’s an opportunity to explore and find out what you like. Parsons hoped the students felt empowered — especially during a time when “like a girl” can still have a negative connotation and women are still breaking down many barriers. So what do students tell people who doubt their intelligence and ability because you’re a girl pursuing a career in STEM? 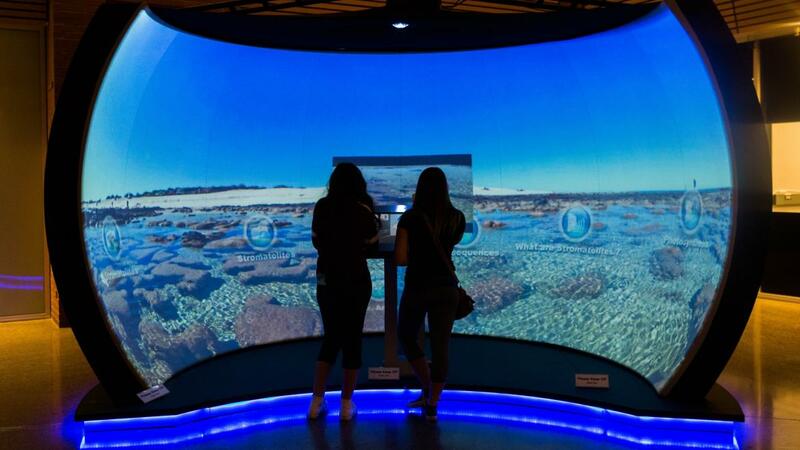 Top image: Eighth-grade girl students from Peoria Unified School District explore SESE's Interactive Immersive Exhibit Environment (I2E2) as part of an introduction to science career opportunities.